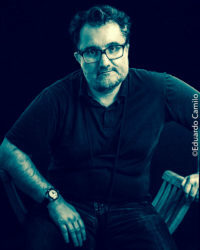 Eduardo Camilo is a professor of semiotics, advertising, and strategic communication at the Department of Communication and Arts, University of Beira Interior, Portugal. He graduated in Communication Studies from the University Nova de Lisboa and holds a Ph.D. and Habilitation in Communication Studies from University da Beira Interior. He was a visiting Professor at the University Federal da Bahía, Brazil (FACOM). His key research focuses on the semiotic and discourse analysis of political (party corporations), corporate (PR strategies), and commercial (advertising strategies) messages. For his Ph.D. dissertation, he studied the post-revolutionary Portuguese Parties discourses broadcast by posters (1974–1975) in which he intended to outline the emergent political rhetoric of that historical period (O cartaz partidário em Portugal (1974–1975), Universidade da Beira Interior, Covilhã, 2004). He is a research member at LABCOM – Communication Laboratory, Portugal.